A Decade of Honoring Two-Wheeled Machines The 10th Annual The Quail Motorcycle Gather ing B Y B R E T T W I L B U R • P H OTO G R A P H Y B Y S T E V E B U R TO N A s far as intimate, exceptional auto-themed events go, The Quail, A Motorspor ts Gathering, which takes place each August during the Monterey Peninsula's famed Car Week, is one of a car connoisseur's top picks. But a smaller scale event honoring two-wheeled vehicles has also come into its own over the past decade. Each May for the past 10 years, motorcycles grace the same lovely greens adjacent to Quail Lodge in Carmel. 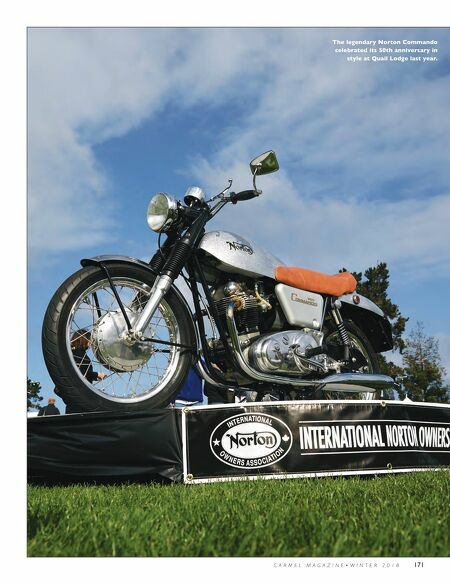 The Quail Motorcycle Gathering, also co-founded by car expert Gordon McCall and Sir Michael Kadoorie, Chairman of the Peninsula Shanghai Hotel Group, showcases pre- and post- war motorcycles and bikes. A 100-mile Friday ride that includes a few laps at Mazda Raceway Laguna Seca followed by the show on Saturday, another ride on Sunday, and a fundraiser Saturday evening makes up the weekend. McCall and his wife Molly, an artist, also host the luxurious and hugely successful McCall's Motorworks Revival in August at the Monterey Jet Center at the start of Car Week, which benefits the CHP 11-99 Foundation. "The events are all related and it keeps my ADD in check," Gordon McCall jokes. 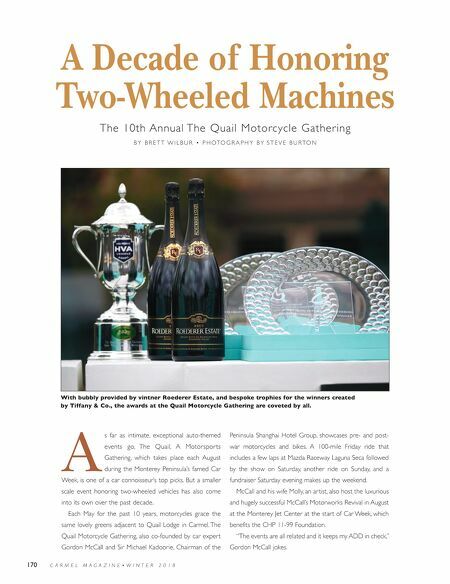 170 C A R M E L M A G A Z I N E • W I N T E R 2 0 1 8 With bubbly provided by vintner Roederer Estate, and bespoke trophies for the winners created by Tiffany & Co., the awards at the Quail Motorcycle Gathering are coveted by all.